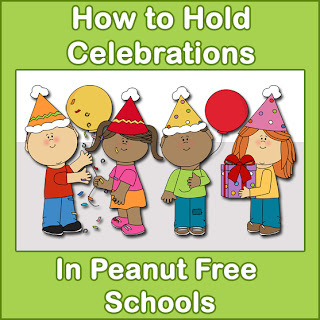 Do you work in a peanut free school? As you may know, there are many food restrictions in order to keep children with life threatening allergies safe. This can pose a challenge to the rest of the school community when it comes to what to eat for lunch and snack. So planning a holiday celebration or special event that centers on food can be especially difficult when no homemade baked goods are allowed. This does not mean you can’t have your class parties, however! So if you want to learn how to have celebrations in peanut free schools, read on. 2. Create a list of possible “menu items” for the party. Fresh fruits are always safe, and most cheeses are too. Make these the staples of the snack selection instead of baked goods and candies. Create a sign up sheet for parents to volunteer for bringing in items. This will avoid having too much or too little of any one item. 3. Supplement the fruit and cheese by checking the labels of snack foods like chips and pretzels. It’s very important to read the ingredients instead of searching online for “safe” brands, because manufacturers can change plants and stop being “peanut free.” Also be aware that any food that says “may contain traces of peanuts or nuts,” because these are unsuitable for peanut free schools. Add these foods to the sign up sheet. 4. Ask the parents of children who have peanut allergies for ideas. Because they are used to 24/7 meal planning that excludes all traces of nuts, they are a wealth of information when it comes to what is or isn’t safe. 5. Invite parents to the party. You can help make the party safer if you have extra adults lookout for food items that “slip through the cracks.” If you invite ALL parents, you may be lucky enough to have the parent(s) of the child(ren) in your class who have the allergy. They can be a valuable resource to have on hand. 6. Keep a positive attitude around the children and other parents. Some people are less understanding than others about how crucial it is to keep the classroom nut free. If parents complain, educating them about anaphylaxis related deaths can help them understand. For children and parents, deflect complaints by saying “we’ll have plenty of food, we won’t even miss the other stuff.” It’s a party, so have fun. Good luck!